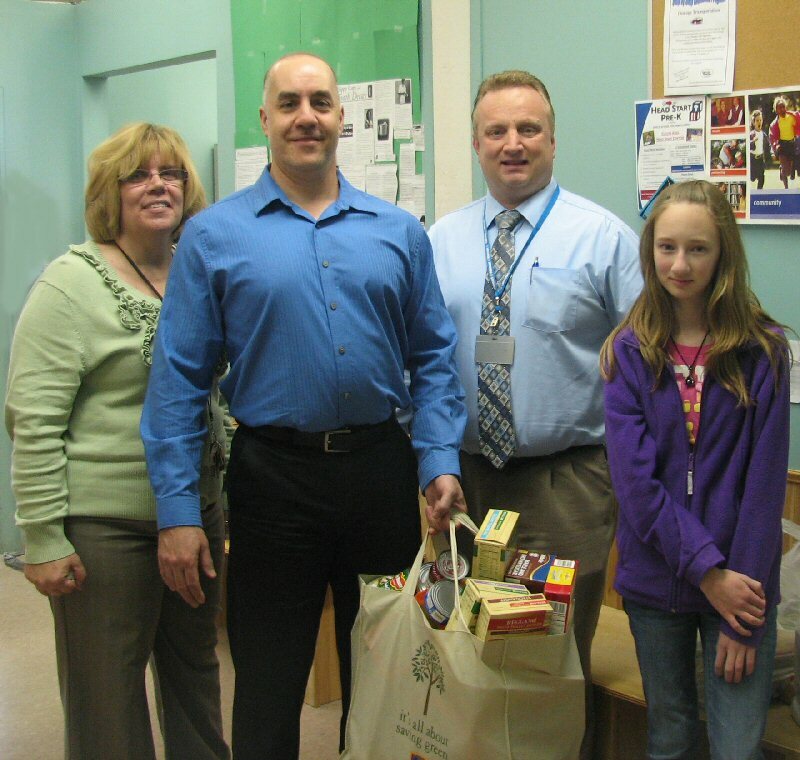 Oswego, NY – When Oswego Middle School student Alexa Hardesty was deciding on a community project to do as part of her National Honor Society responsibilities she remembered a conversation she had with her dad, Mike Hardesty, manager of the Wal-Mart SuperCenter in Granby. Alexa Hardesty an Oswego Middle School student and member of the National Honor Society, recently presented Catholic Charities with a donation for the agency’s food pantry. The food drive was a community service project that she conducted as part of her National Honor Society requirements. From left are: Director of Community Services for Catholic Charities of Oswego, County, Helen Hoefer; Mike Savona of Catholic Charities; Alexa’s father, Mike Hardesty; and Alexa Hardesty. He had mentioned that he and his employees had held several food drives for the food pantry at Catholic Charities as it provides food to hundreds of hungry families in the community. Upon hearing that the food pantry is always in need of donations, she just what she was going to do. Alexa designed a poster asking for donations of non-perishable foods and distributed it families in her neighborhood. She was very happy with the response she received as she collected several bags of food to donate to Catholic Charities’ food pantry. “I was pleasantly surprised when Alexa and her dad delivered the food. We appreciate that she thought about helping our pantry. Her donation will help keep our shelves stocked,” said Helen Hoefer, director of Community Services at Catholic Charities.